Charge is the first think to look for when asked to rank acids and bases without a given Ka or pKa. 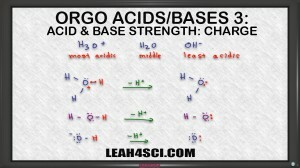 This video shows you how to compare the charges of the acids, or compare the conjugate bases. But more importantly, this video shows you how to tackle any acid/base ranking question by comparing conjugates and analyzing for stability.